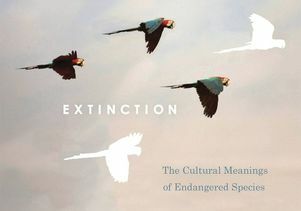 “Imagining Extinction” explores extinction, endangered species and wildlife conservation through the lens of culture and storytelling. It all began with the adoption of a Jardine’s parrot in the mid-1990s. Ursula Heise, UCLA English professor and the Marcia H. Howard Chair in Literary Studies, author and leader in the growing study of environmental humanities, was surprised by the animal’s intelligence and ability to communicate. She began observing birds and other animals in nature and thinking about their survival through the lens of her literary expertise. Twenty years later, she shares a home with three green-cheeked Amazon parrots. And she has just written “Imagining Extinction” — a book that explores extinction, endangered species and wildlife conservation through the lens of culture and storytelling, and reveals much about human nature as well. 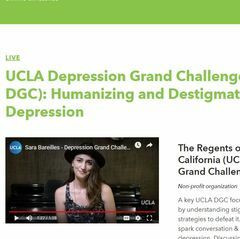 This Q&A is adapted from a longer conversation between Heise and David Colgan of the UCLA Institute of the Environment and Sustainability. What are some of the things you learned about extinction during your research? What’s striking is how much we know about certain groups of species and how little we know about others. The species best studied by scientists and public discourse about endangered species is heavily weighted toward vertebrates. And among vertebrates, we are very heavily concentrated on a few species, the ones we call charismatic megafauna: the aquatic mammals, the bears, the wolves, the rhinos, the whales. Species that we find aesthetically pleasing or that have symbolic value. Everything else gets less attention. It turns out that the science is not as different as I initially expected, coming at this as a scholar of culture and literature. In the science, too, there is a heavy emphasis on vertebrates and on certain species within vertebrates. So cultural values and science are similarly aligned on extinction and endangered species. What do you take away from that? For one, it’s hard to do pure science on biodiversity and endangered species. A lot of the science and public discourse is informed by what I call this elegiac impulse — we’re sort of mourning for what we love and what we believe is endangered. And a lot of the scientists who do this work do it because they are deeply committed and love the species they study. I think it’s very hard for them to extricate themselves from that narrative, and maybe they wouldn’t want to. If we look at other facets of the biological world, would we come up with another narrative? I was also struck by how many people are interested in this and how many people know at least something. My question was more why do we care? How does this come about? And what does that mean beyond scientists and activists? How do other people and entire communities come to care about species about whose biological details they might not know? What are some of the extinction narratives you discovered? One is of the thylacine, a little marsupial that looks like a dog with stripes on its lower back. The species went extinct in Australia 3,000 years ago but survived in Tasmania until the first half of the 20th century. It’s become a symbol for everything threatened about the wilderness in Australia and the havoc that white, European settlers wreaked on the continent. The thylacine is now present everywhere when you go to Australia. It’s on beer bottles, it’s on hats… it’s everywhere as a symbol, and it keeps coming up in environmental debates. Another one closer to home is the rediscovery of the ivory-billed woodpecker in the United States. The ivory-billed woodpecker is sort of a holy grail among birdwatchers. The last confirmed sighting was in 1944, but people kept claiming to have seen it, though no evidence could be found. 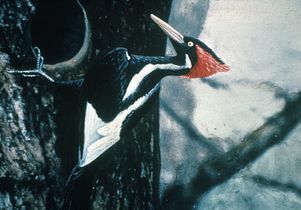 Then in 2004 this article came out in Science, signed off on by 17 prominent ornithologists that said yes, they have found an ivory-billed woodpecker in a remote part of Arkansas. It’s astonishing from the perspective of culture and narrative how much this was reported on. I mean every magazine ran a story on it. The Nature Conservancy and Cornell Lab of Ornithology celebrated it as a big conservation success. Well, it turns out that it probably was not an ivory bill, it probably was a pileated woodpecker — a species that’s quite widespread. A renowned ornithologist published a refutation a few years later, and the discussion just sort of disappeared. Nobody wants to talk about it anymore. Everybody had so much hope and it was such a disappointment that probably this bird really is gone for good. What does the story of the ivory-billed woodpecker say about how we view extinction? A certain image of ourselves as Americans emerged from it — the wild America of the 19th century. There is a really important national and self-perception that goes with that, and it got attached to the story of the ivory bill. You can feel resonating in all these stories a longing to return to nature and to who we were when nature was like that. What these stories also show is that a lot of times endangered or extinct species get linked with stories a particular community tells about its own modernization. For a lot of the world, that means “how we became colonized” — how somebody else came in and devastated our environment. Most of the stories you talk about in the book seem to be driven by a sense of loss, but do any contain notes of optimism? Optimism can come if we broaden the spectrum of what we look at and continue to tell stories of extinction, but also of adaptation, survival and hybridization. I think the story of the green-cheeked Amazon parrots in Pasadena is a good example. They are descendants of escaped pet birds, but they’re increasing in number. They are self-sustaining at this point, and they get along just fine in the urban habitat. That fills me with optimism, that there are certain species that will make it and will actually thrive in altered circumstances. 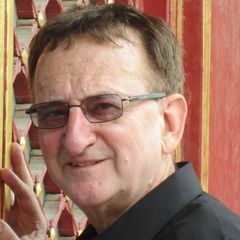 I think if we become a little less obsessed with where things came from and getting rid of things that, in our minds, don’t belong here — and if our conservationist minds are not held in thrall by the idea that we need to go back to something in the past — there are other stories to tell. 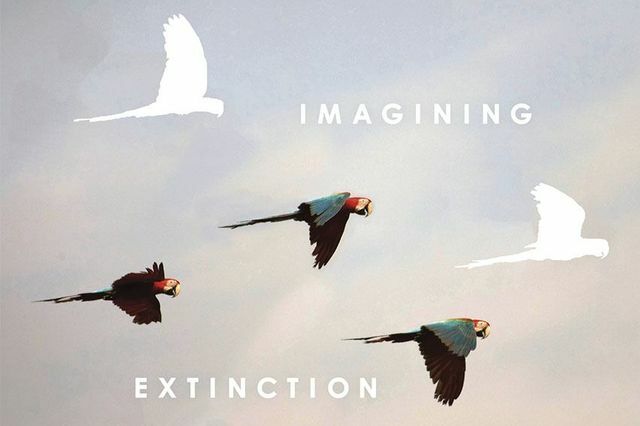 Book cover of “Imagining Extinction” by UCLA English professor Ursula Heise. The ivory-billed woodpecker is an extinct bird that captured the imagination of ornothogists and storytellers. 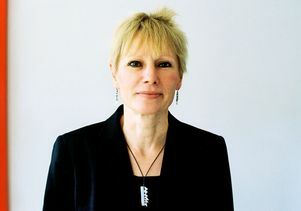 Ursula Heise, professor of English at UCLA.